In the very end of his review of the Russian Club Championship Ivan Smikovski noted that draws turned out almost outside of his attention. The better for me. Our top ten contains two fascinating games from Dagomys ended to the mutual pleasure, and I shall show them. Won games I shall take from other competitions. Let us start with a victory by Vassily Ivanchuk that has shared 11th place with Movsesian – Short. 10.Ґa3. The Dane avoids the main move 10.Ґg2 in order to test a new ambitious idea. If he meant the sport result too, it would be more sensible to reserve the novelty for a more standard-thinking chessplayer than Ivanchuk. 10...0-0. If Black continues 10...¤bd7? as in the main line, then he faces troubles after 11.¤b5 – 11...¤e5 12.Јe3! (even stronger than 12.Јf4 a6 13.Ґxc5 axb5 14.cxb5 with an extra pawn) 12...¤xc4 13.Јf4 a6 (after 13...¤xa3? 14.¤xd6+ ўe7 15.0-0-0 Black is under routing attack) 14.¤xd6+ Јxd6 15.Јxd6 ¤xd6 16.Ґxc5, and White has clear advantage in the ending. 11.¦d1. White delays developing of his kingside, reckoning again on 11...¤bd7 12.¤b5, pressing on the d6 pawn. Ivanchuk's sentence to the novelty is severe. In Kozlov – Adams (Turin 2006) they played 11.Ґg2 ¤bd7 12.Јe3 ¤b6 13.Ґxc5 ¤xc4 14.Јd3 dxc5 15.Јxc4 (draw, Dorfman – Agrest, France 2003) 15...cxd4 16.Јxd4 Јc7 17.¦d1 (more simple is 17.0-0) 17...e5 18.Јb4 a5 19.Јb3 Ґe6 20.Ґd5 Ґxd5 21.¦xd5. 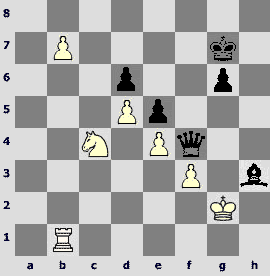 Black is a bit better; White managed to draw in further struggle. 11...Јa5! 12.¤b5. Else White's venture is senseless. 12...Ґd7! Ivanchuk refutes his opponent's play. 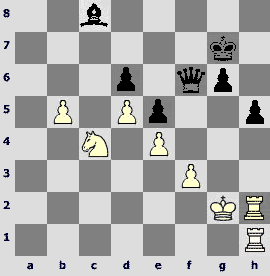 In the case of 12...a6 13.Ґb4 Јxa2 14.¤xd6 ¤bd7 15.Јe3 b6 16.Ґg2 and 17.0-0 White would achieve his goal. 13.Ґb4. In the case of 13.¦xd6 Ґxb5 14.Ґxc5 Ґc6 15.¦xc6 ¤xc6 16.Ґxf8 ¦xf8 (16...¤e5!? deserves attention) Black has clear advantage, so Nielsen decides to take away the offered exchange. 13...Јxa2 14.Ґxc5. 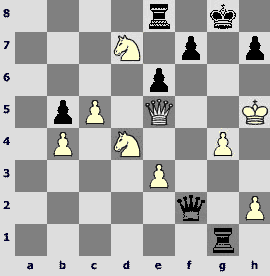 After 14.¤xd6 ¤ba6 White has no sufficient defence against Ґa4, for example15.¤xb7? Ґa4 16.¤xc5 (16.¦c1 ¤b3)16...Ґxd1 17.¤xa6 ¦ad8. 14...dxc5 15.¤c7 Ґa4! 16.¦c1 ¤c6. Worse is 16...Ґc6 17.e4 ¤d7 18.¤xa8 Јb2 19.Јe3 (but not 19.¦d1 ¤e5 20.Јe3 Ґa4, and in the case of 21.¦c1? 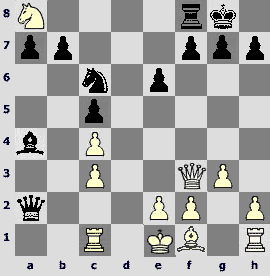 ¤f3+ Black checkmates) 19...Ґxe4 20.¦g1 ¦xa8 21.Ґe2, and after f3 followed by ўf2 White has chances to defend. 17...Јa3! Vassily does not lose the right way. After 17...¦d8 18.Јe3 ¤a5 White has cunning 19.Ґh3! ¤b3 (19...¤xc4? 20.Ґxe6! with the idea 20...fxe6? 21.Јxe6+ ўh8 22.0-0 ¦xa8 23.¦a1 Јb3 24.¦fb1, and White has extra exchange) 20.0-0 ¤xc1 21.¦xc1 ¦xa8 22.Ґg2 – here is a long way to go. 18.Јe3 ¤a5. Black erects a tower of Babel at the left edge of the board. The white knight is of no interest for him for the present. 19.f3. Loses both 19.¤c7? ¤xc4 20.Јf4 e5 21.Јg5 h6 and 19.¦b1 Ґc2! 19...¤xc4 20.Јf4 b5! 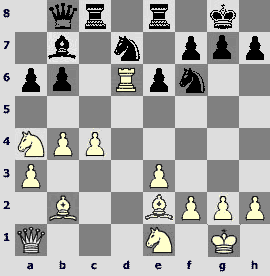 The threat е6-e5 tears links between white pieces. Black's position becomes overwhelming. While delaying capturing the knight for 6 moves, Ivanchuk got richer by a couple of pawns. 24.Ґg2 c4 25.Јc7 Јd4+ 26.e3 Јd8. 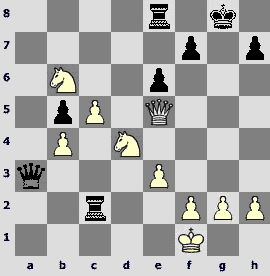 Offering an endgame with three tied passed pawns for exchange. 27.Јe5 ¦c8 28.Јc3 Јd3. also good is 28...a5 29.¦d1 Ґxd1 30.¦xd1 ¤e4+. 29.Јa5. After 29.Јxd3 cxd3 30.¦c1 ¦xc1 31.¦xc1 ¤c4 the pawn reaches the last rank. 29...c3 30.¦e2 ¤b3 31.Јxa7 c2. White resigned. And now – Dagomys. Comments to the game ranked 8th are by Andrei Deviatkin (ChessToday). I have added only one remark, an important one I dare hope. 1.e4 e6 2.d4 d5 3.¤c3 ¤f6 4.e5 ¤fd7 5.f4 c5 6.¤f3 ¤c6 7.Ґe3 Ґe7. The move is becoming more and more popular nowadays. 8.Јd2. The continuation 8.dxc5 0-0! 9.Ґe2?! Ґxc5 10.Јd2 Ґxe3 11.Јxe3 f6! 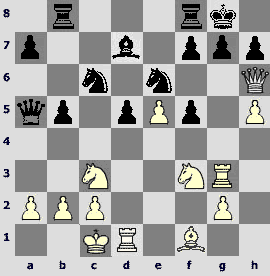 was tested in Shomoev – Riazantsev, Aeroflot open 2007, where White failed. 8...0-0 9.dxc5. Recently, in Zelcic – Riazantsev (Dresden 2007) White chose to castle kingside: 9.Ґe2 a6 10.0-0 b5 11.¤d1 b4 12.c3 a5 – play is unclear (finally, Black won). 9...Ґxc5 10.0-0-0 Јa5 11.Ґxc5. 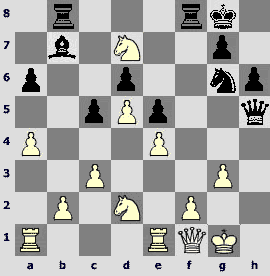 In Shomoev – Potkin (Dresden again) White played 11.¤d4 – see the review by Ivan Smikovski. 12.h4!? I think, this move and the following plan of an impetuous attack had been prepared at home. Earlier they played 12.ўb1, for example 12...Ґd7 13.Ґd3 ¤b4 14.¤d4 ¦fc8 15.g4 Ґa4, and Black has at least sufficient counterplay, I.Saric – M.Gurevich, Cannes 2007. 12...Ґd7?! This natural developing move is not probably the best. 12...¦b8! looks more promising, preparing b7-b5 right away. 13.¦h3! The rook is located perfectly here, performing both attacking and defending functions. c) 14...¦ab8 15.Ґxc6 Ґxc6 16.¤d4 ¦fc8 17.ўb1 – I doubt whether Black has a sufficient compensation. a) if 15...ўh8 then White has 16.¦xg7! (16.h5? h6!) 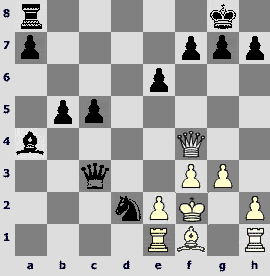 16...ўxg7 17.Јg5+ ўh8 18.Јf6+ ўg8, and apart from perpetual check he has opportunities to continue his attack: 19.¤g5!? (or 19.¦xd5) 19...f4 (White threatened with 20.Јh6) 20.h5!? and so on – needs thorough analysing. b) 15...¤e6 16.Јh6 ¤b4 17.¦xg7+ ¤xg7 18.¤g5 ¦fc8 19.Јxh7+ ўf8 20.Јh8+ ўe7 21.Јxg7 etc. Now Black could hinder his opponent's pawn offensive by 14...h6! 15.f5! exf5. After 15...b4 16.f6! Black must play 16...¤e7! (16...bxc3 17.Јg5 g6 18.Јh6 cxb2+ 19.ўb1 checkmates), though it cannot rescue him also: 17.Јg5! (17.fxe7 ¦fc8 is not so clear) 17...¤f5 18.¤d4 h6 19.Јg4 ўh7 20.¤xf5 ¦g8 21.¤e7 bxc3 22.¦xc3, and White has he decisive material advantage. 16.¦g3 ¤e6. Black has no time for 16...ўh8: 17.¦xg7! ўxg7 18.Јg5+ ўh8 19.Јf6+! (19.h6 ¤e6 20.Јf6+ ўg8 and Јa5-d8) 19...ўg8 20.¤g5! ¤e6 21.Јh6! ¤xg5 22.Јxg5+ ўh8 23.Јf6+ ўg8 24.h6 checkmating. The main idea of the attack – ¦xg7+ ¤xg7, ¤g5. Black has to look for his chances in a counterattack. 17...¤b4! 18.¦xg7+ ¤xg7 19.¤g5 ¦fc8 20.Јxh7+ ўf8 21.h6. Somewhat worse is 21.Јh8+ ўe7 22.Јxg7 ¦xc3 as the h-pawn stays on h5. 24.bxc3?! First of all, White should approach his queen to the enemy king: 24.Јxf7+ ўd8 25.Јf8+ ўc7 26.Јd6+ ўc8 27.bxc3. 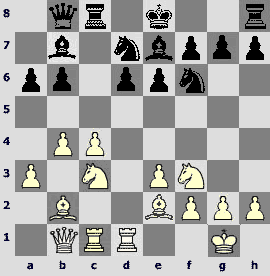 According to computer, White wins, the h-pawn playing the decisive role: 27...¤xa2+ 28.ўb2 ¦b6 29.Јc5+! ¦c6 30.Јa3 Јxa3+ (30...Јxc3+ 31.Јxc3 ¤xc3 32.e6 ¤xd1+ 33.ўc1) 31.ўxa3 ¤xc3 32.h7ќ or 28...Јxc3+ 29.ўb1 ¤b4 30.Ґd3 ¦b6 31.Јxb6! axb6 32.h7 Јxe5 33.¤f7. M.N. The latter variation needs working up. After 29...¦b6 computer estimates dance crazily and it is unclear which conclusion of the iron assistant can be considered final. I shall content myself by adding a couple of lines to the analysis by Deviatkin; maybe we can reach more clearness gradually. 30.Јf8+ (30.Јxb6 axb6 31.h7 Јxe5 32.ўxa2 Јc3) 30...ўb7 31.Јe7 ¤b4 32.Јxd7+ ўa8 33.Ґd3 ¦a6 34.Јe8+ ўb7 35.Јxb5+ ¦b6 36.Јxb6+ (36.Јd7+ ўb8) 36...axb6 37.h7 ¤xd3 38.¦xd3 Јe1+ 39.ўb2 Јb4+ 40.¦b3 Јd4+ 41.ўa2 Јd2 – draw? 24...¤xa2+ 25.ўb2?! A draw is inevitable now. Probably, Najer was in his habitual zeitnot. He could try to play for win still: 25.ўd2 Јxc3+ 26.ўe2 Јxc2+ 27.ўe1, and White has chances to hide from checks. 26...Јa3! 27.Јh8+. Or 27.Јxf7+ ўd8 28.¦d3 Јc1+ 29.ўxa2 Јxc2+ 30.ўa1 Јc1+=. 27...ўe7 28.Јf6+ ўe8 29.Јh8+. Draw. I return to the commentator's cabin. We shall see a duel ranked 7th in the May top list. 10...¤h5. There is no strict theory in this quiet opening, players are acting on the basis of general considerations, trying to outplay the opponent positionally. Usually, trading of dark-squared bishops occurred somewhat later, for example 10...a6 11.Јe2 ¤bd7 12.¦ad1 ¤h5 13.Ґxe7 Јxe7 14.Ґe4 Ґxe4 15.¤xe4 ¤hf6 16.¤g3 b5 17.e4 cxd4 18.¦xd4 ¤b6 19.¦ed1 ¦fd8 with equality, Balashov – Lerner, Kiev 1986. 11.Ґxe7 Јxe7 12.e4. It is time! Playing White still presumes some initiative in struggling for the centre. 12...¤f4 13.Ґf1 ¤d7 14.d5 e5. It was no need to make haste with this move. The play acquires Indian outlines. Black does not have bad dark-squared bishop, but has not very good light-squared one. White first begins active operations on "his own" side. 15.g3 ¤g6 16.Јc2. I think 16.¤c4 right now would be better as White may not fear of 16...f5; on the contrary, he would only welcome it: 17.exf5 ¦xf5 18.¤fd2 with the idea 18...Ґxd5? 19.¤e3. 16...¤f6 17.a4 a6?! Baadur did not like passive 17...Ґc8 18.a5 Ґd7 19.axb6 axb6 20.Јb3 ¦xa1 21.¦xa1 ¦b8 22.¦a7, and he tries to draw White out of his shell. 18.¤c4 Јc7 19.Јb3 ¤d7. The knight let the queen pass to the left half of the board and came back so that Black could start his offensive on the king's flank. Strangely as it sounds, but it is the case. 20.Ґh3! The most high-principled and strong continuation. 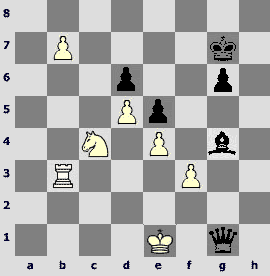 White gains a pawn at the cost of weakening his king's position. 20...¦ab8 21.Ґxd7 Јxd7 22.¤xb6. On 22.Јxb6 Black would reply 22...¦fd8 – it is more accurate than 22...Ґxd5 23.Јxd6 Јxd6 24.¤xd6. 22...Јh3 23.Јc4. 23.¤d2 Ґc8 24.a5 f5 25.Јc4 (25.exf5 ¦xf5 and then ¦h5) 25...f4 leads to approximately same positions. 23...f5. If 23...¤f4 then naturally 24.Јf1. 24.¤d2. Bad is both 24.¤d7? fxe4 25.¤xf8 exf3 and 24.exf5? Јxf5 25.¦e3 e4. 24...f4 25.Јf1 Јh5!? All or nothing. Black begins to offer as a sacrifice half of his material. 26.¤d7. Curiously,this dainty square is mined in a sense. However, it would be unreasonable not to pay attention to the opponent's actions: after exemplary 26.b4 fxg3 27.hxg3 ¦f7 28.f3 (28.¤dc4 ¦bf8 29.¦a2 ¤f4) 28...¦bf8 29.Јg2 cxb4 30.cxb4 Јg5 with the idea h5-h4 Black develops his initiative when his forces are concentrated significantly at the key part of the board. 27...¤f4. Black has nothing more already. In the case of 28.gxf4 ¦xf4 29.f3 (after 29.¤xb8 ¦g4+ 30.Јg2 ¦xg2+ 31.ўxg2 Јg5+ Black captures the knight on d2, and on 29.¦e3 follows 29...Јg4+) 29...¦d8 30.¤b6 ¦h4 31.Јg2 ¦f8 32.¤f1 ¦xf3 33.¦e3 ¦ff4 34.¦ae1 White has time to gather big forces for defending and he seems to repel the attack, the black bishop being idle. However, Black has another way: immediate 28...Јg4+ 29.Јg2 Јxd7 30.f5 a5. He is only a pawn down, counterplay is possible. b) 29...Ґc8! 30.f3 ¤g5 (in the case of 30...¤f4+ 31.ўf2 Јh2+ 32.ўe3 ¤g2+ 33.ўd3 the attack chokes) 31.Јh1 Ґh3+ 32.ўf2 ¦xb8. Black has comparatively light losses. He can create little threats but seems to have no compensation. 28...¤h3+ 29.ўg2 ¦xf8 30.f3 Ґc8. Threatening with 31...¤f4+ and 32...Ґh3. 31.Јe2. 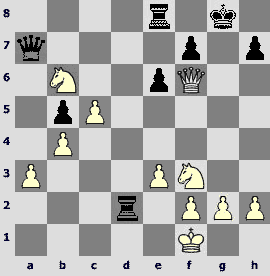 31.Јh1 Јg5 32.¦ed1 ¤f4+ 33.ўf2 ¤h3+ 34.ўg2 leads to a draw. 31...¦f6. It is stronger than 31...Јg5 32.Јe3 ¤f4+ 33.ўf2 ¤h3+ 34.ўe2 Јxg3 35.¦f1. 32.¦h1 ¦g6 33.Јe1. 33.Јe3 Јh4 34.¦h2 ¦xg3+ 35.ўh1 is hardly more promising than the text continuation. 33...Јh4 34.¦h2. In the case of 34.¤f1 ¤f4+ 35.ўg1 Black chooses between draw after 35...¤h3+ and fighting 35...Ґh3. 34...¦xg3+! 35.Јxg3 ¤f4+ 36.ўf2 ¤d3+ 37.ўg2 ¤f4+. Having two rooks for a bishop, Kiril did not agree to draw and turned into a sacrificer in his turn. 38.Јxf4 Јxf4 39.¤c4 Јf6. Computer says 39...Ґd7 was possible. After 40.¤xd6 Јg5+ 41.ўf2 (41.ўh1? Јf6) 41...Јd2+ 42.ўg1 Јg5+ 43.¦g2 there is no forced draw, but Black's position is very solid. However, there is no objection to defending of the d6 pawn also. 40.b4. Attacking a bishop by 40.¤b6 parries by 40...Јg5+ 41.ўh1 Јg3, and if 42.¤xc8? then 42...Јxf3+ 43.¦g2 Јh3+ or 43.ўg1 Јg4+. 40...cxb4 41.cxb4 h5?! Too passionately. 41...Ґd7 is more quiet. 45.¦b1. Another perspective try is 45.b6. In the case of erroneous 45...Јg5+ 46.ўf2 Ґa6 White strikes an unexpected combinative blow 47.¦xh5! gxh5 48.¦g1 and wins. In head-breaking variations arising after 45...Ґa6!? 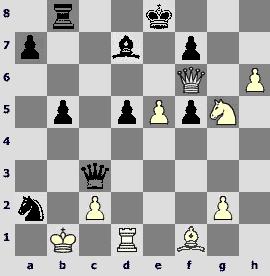 46.¦b1 Јg5+, Black seems to make a draw, but with much adventure. Probably, Jobava would play as in the text: 45...Јf4 46.¦f1 h4 47.ўg1 Ґa6 48.¦b1 Јxf3 49.b7 Ґxb7 50.¦xb7+ ўh6, and White cannot win. 45...Јf4 46.b6?! 46.¤xd6 would put more problems, with exemplary 46...h4 47.¦f1! (47.¤xc8 Јg3+ 48.ўh1 Јxf3+ 49.ўg1 Јxe4 attacking both the rook and – through g4 – the knight) 47...Јd2+ 48.ўh1 Јd3 49.¦hf2 Ґh3 50.¦c1 Јa3 51.¦c7+ ўh6 (51...ўg8 52.b6!? Јxd6? 53.¦a2! Јf8 54.f4 loses, but by means of 52...Јe3 Black secures a draw; White, however, may search for something less spectacular than 52.b6!?) 52.¤f7+ ўh5 53.b6 Јe3 54.¦cc2 Јxb6 55.¤xe5. Black possibly does not lose but has to suffer. After the text move the following is nearly forced. 46...h4. It is more clear than 46...Ґg4 47.¦b3. 49.ўf2. After 49.ўxh3 Јxf3+ 50.ўh2 perpetual check arises. Georgiev is not ready to admit inevitability of a draw yet. 49...Ґg4 50.¦b3. 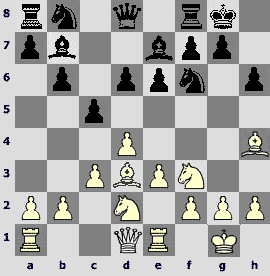 In the case of 50.b8Ј Јxf3+ 51.ўg1 Јg3+ 52.ўf1 Јf3+ White must choose between mate in 1 and checks to his king. 50...Јh2+ 51.ўe1. White should be cautious: he loses after 51.ўe3?? Ґxf3. 52.ўe2!? The last bait for Black. 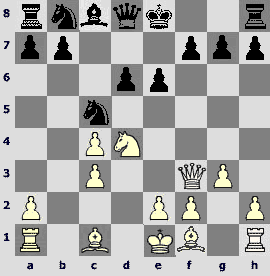 In the case of 52.ўd2 Јd4+ 53.¦d3 Јa7 54.¦b3 Јd4+ the game ends by repeating moves. 52...Јg2+ 53.ўe1 Ґxf3 54.¦xf3 Јxf3 55.b8Ј Јxe4+ 56.ўd2 Јxd5+. Not tempting fate any more. A queens endgame after 56...Јxc4 57.Јxd6 is surely drawn in the case of both 57...Јd4+ 58.ўc2 Јc4+ 59.ўb2 Јd4+ 60.ўb3 and 57...e4! but Baadur acts more simply. 57.ўc3 Јd4+ 58.ўb4 e4 59.Јxd6. Draw. In all previous games they traded rooks generously for minor pieces and pawns. The last example (5-6 places) brings this tendency into full shining. 1.d4 ¤f6 2.c4 e6 3.¤c3 Ґb4 4.Јc2 c5 5.dxc5 Ґxc5 6.¤f3 Јb6 7.e3 Јc7. Having lost a tempo, Black prevented developing the opponent's dark-squared bishop on f4 or g5 and began to build 'hedgehog' structure. 8.a3. 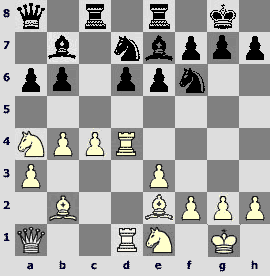 Even hedgehog would not be surprised nowadays by the idea g2-g4 in various openings. 8.g4 or 8.b3 a6 9.g4 occurred here also. But the Australian grandmaster prefers to play on the opposite flank. 8...b6 9.b4 Ґe7 10.Ґb2 a6 11.Ґe2 Ґb7 12.0-0 d6 13.¦ac1 ¤bd7 14.¦fd1 ¦c8. Obligatory play is practically over. In further manoeuvering one should take into account his partner's actions. In the blitz game against Topalov (Wijk aan Zee 1998) van Wely (White) continued to move his pieces too sluggishly allowing the opponent to concentrate fire on the c4 pawn: 15.Јb3 0-0 16.h3 Јb8 17.¦d2 ¦c7 18.¦cd1 ¦fc8 19.Ґa1 Ґxf3! 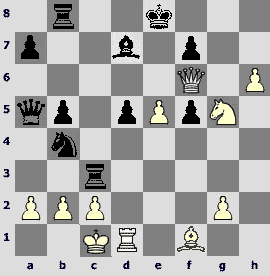 20.gxf3 (in the case of 20.Ґxf3 ¤e5 White loses a pawn) 20...¤e5 21.¦d4 Јa8 with Black's initiative. 16.Јa1!? A reasonable idea. The queen does not hinder his pieces and takes part in creating pressure on Black's position. 16...0-0. It is too early to give away the light-squared bishop in this situation: after 16...Ґxf3 17.gxf3! 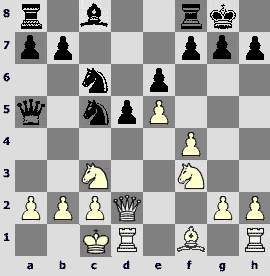 ¤e5 (else 18.f4) 18.¤e4 White's predominance in the centre compensates for defects of his structure. 17.¦d4. The rook tries to provoke e6-e5 hoping to get the d5 and f5 points for minor pieces. 17...Јa8 18.¦cd1 ¦fe8. One can propose 18...¦fd8!? 19.¤e1 ¤e5. The standard 19...d5 leaves an isolated pawn for Black, because in the case of 20.cxd5 ¤xd5 21.¤xd5 Ґxd5? 22.e4 he loses a piece. He could stand a while – 19...Ґc6 or 19...Ґf8. 20.¤a4 ¤ed7. In the case of 20...¤fd7? Black's construction is overloaded: 21.¦xd6 Ґxd6 22.¦xd6 (black knights and the b6 pawn are hanging) 22...Ґc6 23.¤xb6 ¤xb6 24.Ґxe5. b) 26.¦d7 Јxb6 27.Јxf6 ¦f8, and stubborn declining of drawn variations may cost much for White: 28.¦d4 (28.Јg5+ ўh8 29.Јe7 ўg7 30.¦d4? e5!) 28...¦e8 29.¦g4+? (29.¦d7 ¦f8=) 29...ўf8 30.¦g7 ¦e7 followed by ўe8. At this moment Rogers demonstrated a highly original way of making 'hedgehog' harmless. 21.¦xd6!? Ґxd6. In the case of intermediate 21...Ґc6 White, if not satisfied by 22.Ґxf6 Ґxf6 23.¤b2 ¤e5, may let loose his rooks' temper: 22.¦xd7!? ¤xd7 23.¦xd7! Ґxa4 (after 23...Ґxd7? 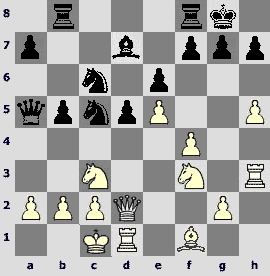 24.¤xb6 Јb7 25.¤xc8 ¦xc8 26.Ґxg7 White gains three pawns for the exchange with clear estimate) 24.¦xe7!? ¦xe7 25.Ґxg7. He has two pawns for two exchanges but with obvious positional compensation. 22.¦xd6 Јb8. If Black could be fully imbued with his partner's plan then he would probably prefer 22...¦c6 23.¦d2 with a complicated play. 23.¦xb6! You cannot often see something like this even in games of T.V.Petrosian and Sh.Mamedyarov. 23...¤xb6?! The rook will not go anywhere. Black should wait a little – after после 23...¦cd8 24.c5 ¤xb6 25.¤xb6 ¦d2 26.Ґf3 Ґxf3 27.¤xf3 ¦dd8 would stay unclear. 24.¤xb6 ¦cd8 25.Ґe5. Maybe it was worth playing 25.Ґxf6 gxf6 26.Јxf6 with the idea c4-c5, ¤c4-d6, but Rogers for certain did not like that in this case the black queen can join the defence by Јc7-e7. By the text move White puts the opponent's strongest piece out of play. 25...Јa7 26.c5! Black's kingside will be destroyed inevitably. 26...¦d2 27.ўf1 Ґc6. Deserved attention 27...¤e4!? in order to get counterplay after 28.Ґxg7? a5! To retain his advantage White should play 28.f3! f6 29.fxe4 fxe5 30.¤f3 ¦dd8 (30...¦xe2 31.ўxe2 Ґxe4 32.Јxe5±) 31.Јxe5 Ґc6 32.a4 Јb7 33.ўg1!, and if 33...Ґxe4 then 34.Ґxa6 Јxa6 35.Јxe4. 28.Ґxf6 gxf6 29.Јxf6 Ґb5 30.Ґxb5 axb5. The black queen is preparing to enter the scene; White must act resolutely as he has not so much forces for attack at the moment. 31...¦c2? After correct 31...¦a2! I could not find a clear way for White to win (who needs unclear one?!). On 32.¤e5 follows 32...Јe7! In the case of 32.¤d4 Јxa3 the rook is not under attack (as is the case in the text), which gives Black a very important tempo and additional tactical possibilities, for example 33.Јg5+ ўh8 34.Јe5+ ўg8 35.g4 Јd3+ 36.ўg2 f6! 37.Јxf6 Јxe3 38.¤d7 Јe4+ 39.ўg3 e5 threatening with 40...Јf4+. Finally, after 32.Јg5+ ўh8 33.Јe5+ (33.¤e5 f6! 34.Јxf6+ Јg7) Black cannot play 33...ўg8? 34.¤d5!, but giving away a pawn by 33...f6! 34.Јxf6+ Јg7 35.Јxg7+ ўxg7 he obtains an endgame where his rooks manage to organize a counterattack sufficient for escape: 36.¤d4 ¦xa3 37.¤xb5 ¦b3 38.¤d6 ¦d8 39.b5 ¦b2! 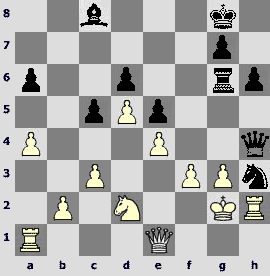 40.¤bc4 ¦c2 followed by ¦f8, and in the case of the f-pawn advance – ¦a8. 32.¤d4 Јxa3 33.Јg5+. Of course not 33.¤xc2? 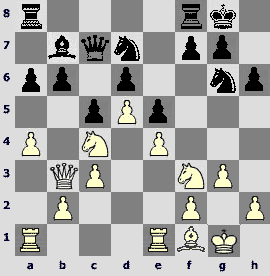 Јd3+ 34.ўe1 Јxc2, and White's attack expires. 35.g4! Јa1+. Does not save 35...Јd3+ 36.ўg2 f6 (36...¦c1 37.¤d7 Јf1+ 38.ўg3 Јg1+ 39.ўh4 Јxf2+ 40.ўh5ќ) 37.Јxf6 Јe4+ (37...Јxe3 38.¤xc2 Јe4+ 39.Јf3 Јxc2 40.¤d7) 38.ўg3 ¦c1 39.h3! 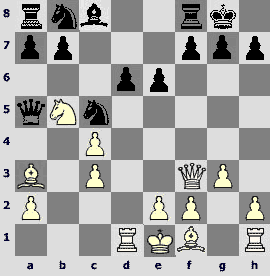 White's king is safe and the black one will suffer from enemy cavalry soon. Moreover, exchange of queens would not help when the white king is active. 40...f6 41.¤xf6+ ўf7 42.¤xe8. Black resigned. Rooks beg for mercy and I must say good-bye.